Six cannabimimetic indoles have been identified as adulterants in herbal or chemical products being sold illegally in Japan, with four of the compounds being new as adulterants to our knowledge. The identifications were based on analyses using gas chromatography–mass spectrometry, liquid chromatography–mass spectrometry, high-resolution mass spectrometry, and nuclear magnetic resonance spectroscopy. The first two compounds were identified as phenylacetyl indoles JWH-251 (2-(2-methylphenyl)-1-(1-pentyl-1H-indol-3-yl)ethanone; 1) and its demethyl-methoxylated analog JWH-250 (2-(2-methoxyphenyl)-1-(1-pentyl-1H-indol-3-yl)ethanone; 2). Compound 2 was identical to that found as an adulterant in the UK and in Germany in 2009. The third compound was naphthoylindole JWH-081 (1-(4-methoxynaphthalenyl)-(1-pentyl-1H-indol-3-yl)methanone; 3), and the fourth was JWH-073 (1-naphthalenyl(1-butyl-1H-indol-3-yl)methanone; 4), which had been identified as an adulterant in our previous study. Two additional compounds were JWH-015 (1-naphthalenyl(2-methyl-1-propyl-1H-indol-3-yl)methanone; 5) and JWH-200 (1-naphthalenyl(1-(2-(4-morpholinyl)ethyl)-1H-indol-3-yl)methanone; 6). Compounds 1–4 and 6 were reported to be synthetic cannabinoids with selective affinity for cannabinoid CB1 receptors, while compound 5 was reported to be a selective CB2 receptor agonist causing immunosuppressive effects without psychotropic affects. One product contained both CB1 and CB2 receptor agonists in our collection. 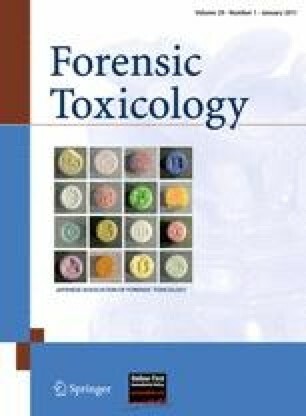 Quantitative analyses of the six cannabimimetic compounds in 20 products revealed that there was large variation in concentrations of the detected compounds among products; for herbal cutting products, the total amounts of these cannabinoids ranged from 26 to 100 mg.
Part of this work was supported by a Health and Labor Sciences Research Grant from the Ministry of Health, Labour, and Welfare, Japan.